With several races so close they will go into recounts we wanted to take a little time to digest the results of Tuesday’s Republican Primaries and the Ohio Special Election for Congress. After looking at the final numbers several things are clear, but three points really stood out as being important to the midterms and whether Republicans keep control, or lose control, of the House. The first one is proof of CHQ Chairman Richard Viguerie’s oft-repeated dictum that Republicans never win unless they nationalize the big elections. To win Republicans must nationalize the election by campaigning on a conservative agenda— drawing a sharp contrast between the Democrat worldview and the conservative worldview. As Mr. Viguerie pointed out in his book TAKEOVER, the 1994 “Contract with America” congressional campaign drew a sharp contrast with Democrats on balancing the budget, term limits, and other issues. Likewise, in 2010, Tea Party candidates, without any real direction from the national GOP, drew a sharp contrast with Big Government Republicans and with the Democrats on taxes, spending, the growth of government, and especially on Obamacare. Nationalizing the election powered the GOP wave that picked up six Senate seats and won a historic sixty-three seats in the US House of Representatives, recapturing the majority, and making it the largest seat change since 1948 and the largest for any midterm election since the 1938 midterm elections. But nationalizing the election requires Republicans to develop a national agenda and then to campaign on it – make speeches, run TV and radio ads and bypass the national media filter through direct mail and online campaigns. And for Tuesday’s Special Election for Congress in Ohio-12, the only person who was doing that was President Donald J. Trump. 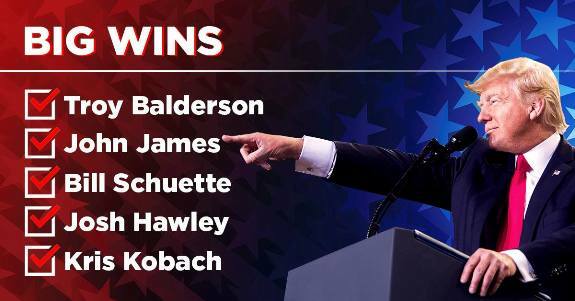 Had President Trump not come into Ohio for a huge rally to nationalize the election and the final days of the campaign put the focus in on his Make America Great Again agenda, it is clear to us that Republican Troy Balderson would have lost, and Democrat Danny O’Connor would have won. Which brings us around to the corollary to Mr. Viguerie’s point about nationalizing the election: If you are a Republican congressional candidate running in 2018, and you want to win, don’t wait around until the weekend before the election to nationalize the election and run on President Trump’s agenda. Another point, on nationalizing the election: It also works in Republican Primaries. We can’t remember the last time a sitting Republican Governor was defeated in the primary, but today Kansas Secretary of State Kris Kobach leads incumbent Governor Jeff Colyer by fewer than 200 votes in the state's Republican primary. Kobach ran on the MAGA agenda and was endorsed by President Trump in the last days of the campaign, Governor Colyer ran as a conventional establishment Republican and it looks like he lost. A final observation: Trump derangement syndrome coupled with superior technology is what’s making Democrats competitive. The Democrats have no broad message – they can’t go on TV and tell the broad mass of the electorate that they want to raise taxes, open the borders and reimpose the regulatory state that Trump is dismantling. If they did they’d lose, big time. Instead, they are relying on microtargeting Democratic voters through direct mail and online campaigns attacking President Trump and then following up with sophisticated voter contact campaigns to turn out the voters who respond positively to the anti-Trump message. In the OH-12 2016 general election Republican Patrick Tiberi defeated Democrat Ed Albertson 66% to 30% with 251,266 votes to 113,000 votes. On Tuesday Troy Balderson defeated Democrat Danny O’Connor by less than 1% of the vote. Balderson had 100,052 votes compared to Tiberi’s 251,266 votes in 2016 or 40% of the 2016 turnout. Contrast that to the results on the Democratic side; Danny O’Connor had 98,364 votes on Tuesday compared to 112,638 votes received by Democrat Ed Albertson in 2016 or 87% of the 2016 Turnout. With an 87 percent to 40 percent turnout advantage the lesson here is that the anti-Trump message will motivate the Democrats to go to the polls, particularly if it is delivered through a sophisticated microtargeting campaign, but running as a Paul Ryan or John Kasich Republican will not motivate the majority of Trump’s conservative – populist voters to vote for a Republican, even if, at the last minute, that candidate embraces some of Trump’s issues. Submitted by email_registrat... on Fri, 08/10/2018 - 13:08.
positive effects of Trump's Presidency on the economy and foreign affairs will not want to go back to the failed policies of the Democrats. The Republicans will turn out. It is the Democrats who have to continue to try to galvanize their base with a message that is clearly missing. It is a problem for which there is no solution. There is no way they are going to convince their voters to "win one for the Gipper" when there is only Socialism and a frail message that the policies that led to 8 years of sluggish growth will somehow work if given another chance. They see with their own eyes how the Trump Presidency has succeeded in a massive way in an in creditably short time. No one but the most ardent liberal will want to throw all that away just to put their wonks back in power.